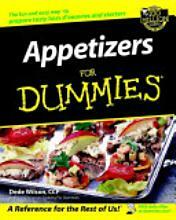 Appetizers for Dummies is stuffed with over 75 international recipes as well as theme menus and time saving recipes. Serving appetizers is an affordable, delicious way to entertain! In fact, the book is so popular that it has been translated into Spanish as well as Bulgarian! This practical guide gives you recipes for making delectable bite-sized wonders that will suit any occasion – from an informal gathering to a sit-down dinner. You also get party planning tips as well as advice on experimenting with flavors and international cuisines. Some of my favorites are the Vietnamese Spring Rolls with Peanut Dipping Sauce, Baked Brie with Dried Cranberries, Pecans and Grand Marnier, and you can’t beat Homemade Potato Chips.